Life can take strange turns. I never thought I would cook for groups of people, a few months a year, twice a day, in a mini-kitchen in Greece – something I do regularly and with pleasure on the open-retreat weeks in Artisa. Often when I’m cooking there, my thoughts go to my grandmother Cato. In her pre-war kitchen, she cooked a complete meal at lunch time for her ten children, her husband and the staff from the carpentry workshop. As the years progressed, the group expanded with friends, future husbands and wives, a wanderer, sometimes a priest, and people who had to hide during the war. Grandma cooked. With her large family she had a cleaning lady and staff for the store, but grandmother cooked. What was special was that she had received cooking education at a reputable hotel in Valkenburg in the south of Holland. Girls from ‘well-to-do-families’ were sent there for a thorough training, where they had to work hard. She was probably sent there, such that she could learn how to organize receptions and cook official dinners, in case she would marry a husband who often had to receive guests due to his work. That is at least a twist I give to the story. But she married a simple carpenter, who enjoyed his wife’s cooking skills very much. Grandma enjoyed her training, despite or thanks to the hard work. 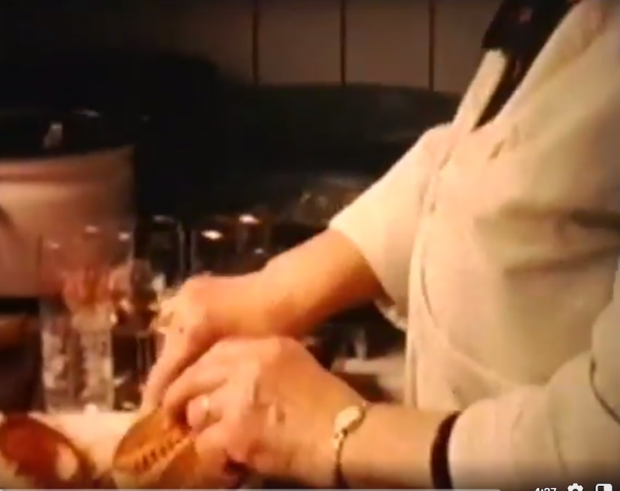 While the majority of her peers cooked the local recipes from Limburg, my grandmother experimented. New vegetables and food came on the table. In the war she even spent her last money on something tasty. My mother whose task it was to find food for the whole family in these years of scarcity, paid a guilder for an egg. An enormous amount of money in that time. “Well,” grandma said, “if that is the price then we have to pay it, so be it.” Ten carefully saved guilders went up to ten eggs. In terms of purchasing power, that would be comparable to seventy euros now. I can imagine that no egg ever tasted as good as that egg, dearly paid for to a stingy farmer. One of my sisters, who regularly stayed with my grandmother as a child, recently told me that one day at grandmother’s place, they had Parmesan cheese for the first time. With her nose closed, because of that strange, sharp smell, she ate it. Before she knew, she kept on eating, because she tasted how good it was. As a child, I regularly visited grandma with my mother, in that big house with the furniture store at the front and the workshop at the back. We were always received warmly, but I couldn’t make sense of her. On arrival, grandmother would greet me by saying: “ child, keer mich de plaots ‘s euve”, which meant you had to sweep the courtyard behind the house. Before you knew it, you found yourself with a broom in your hand swiping the place. She was not really sweet. There was a distance I felt, instead of a genuine connection. Until the day she invited me into her kitchen. I had complained to her that I liked to eat rice pudding, the only type of pudding I liked, but that my mother never made it. I was brought into her sanctuary and there, at the kitchen counter, I saw a woman who mastered the skill of mixing, intuitively adding the right amounts, of patiently stirring, smelling and tasting. Suddenly I saw the dedication she put into all those daily meals. She showed me what was in the rice porridge recipe. “The most important thing,” she told me, “is a lot of patience.” Something we are not generously endowed with in my family. What she did not name, but what I felt vaguely as a twelve-year-old was the love, the unconditional love that she put into the pot while stirring. What did the rice pudding taste creamy, sweet and full, with just the right consistency. From that moment on I saw my grandmother with different eyes. We had made a covenant in that simple kitchen. Although she had more than thirty grandchildren, I suddenly felt a special bond. For years, I wondered what the recipe for the rice pudding was; I had not written it down. 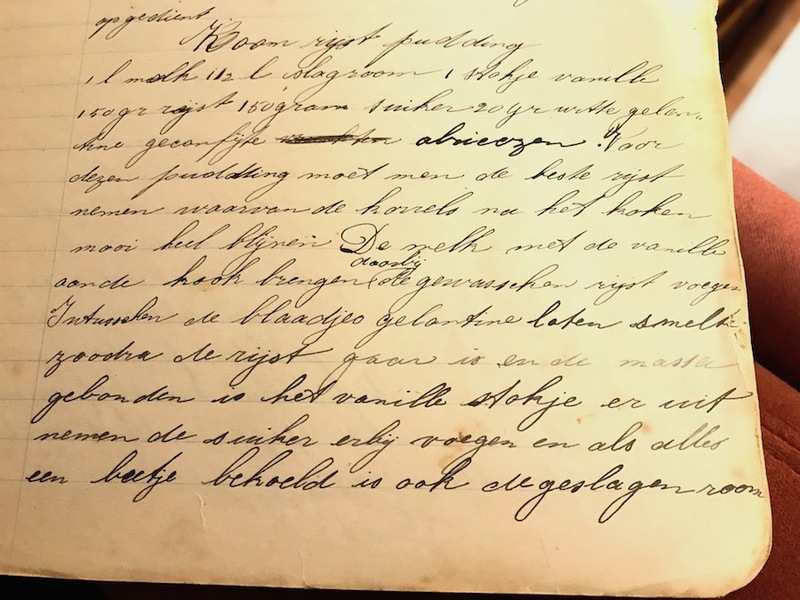 Just lately I discovered that another sister has an old recipe book from our grandmother, where to my surprise I found a number of variations on the rice pudding recipe in a neat, obliquely written manuscript. 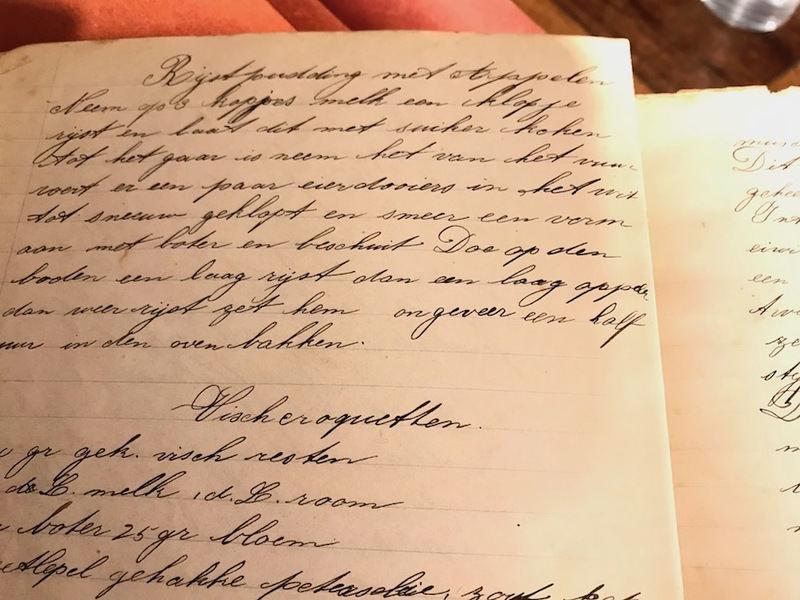 Recipes written in old Dutch and French, the foreign language in that time.